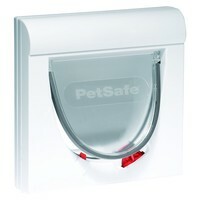 The Petsafe Staywell Classic 4 Way Magnetic Cat Flap will help to limit your cat’s movements into and out of your home when you’re not around. Designed with the classic shape that everybody knows and loves, this Petsafe Staywell Classic has been developed to only recognise cats wearing a special magnetic collar and can be set to one of 4 settings quickly and easily. These are: Fully Open, Fully Closed, In Only or Out Only.